We are a US EPA registered printer of the new EPA Uniform Hazardous Waste Manifest forms (Form 8700-22 (Rev. 12-17) and Form 8700-22A (Rev. 12-17). A number of states have additional requirements regarding the use of the new EPA Uniform Hazardous Waste Manifest forms. Some states require copies to be submitted to the state and/or have state specific waste codes in addition to the federal waste codes that must be entered onto the new Uniform Hazardous Waste Manifest forms. You will need to check with your state to determine what, if any, additional requirements they stipulate. 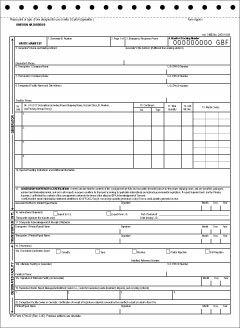 The new EPA Uniform Hazardous Waste Manifest form is a 5-part form made with carbonless paper. It measures 8 1/2" by 11" after the stubs are detached. There are two versions of the form. The primary form that you will be using is the Uniform Hazardous Waste Manifest "EPA Form 8700-22 (Rev. 12-17)". It comes with a unique Manifest Tracking Number (MTN) preprinted at the top right of the form. You will also need the Uniform hazardous Waste Manifest (Continuation Sheet) "EPA Form 8700-22A (Rev. 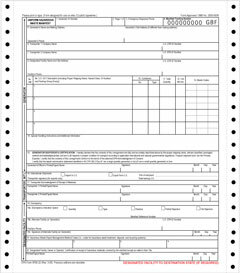 12-17)" version of the form if more than two transporters are involved, or if you need more space than is provided on the Uniform Hazardous Waste Manifest. Depending on your needs you can select either a snap-out or continuous configuration of the forms. The continuous configuration has a tear-off stub running down both sides of the form. It is for use with computer dot-matrix (impact) printers. It is sold in cartons of 300 forms.The snap-out configuration of the form has the tear-off stub at the top of the form. It is for use in a typewriter or as a hand written form. It is sold in packages of 50 forms. We worked closely with the EPA Office of Solid Waste to help develop the manufacturing standards and evaluation tools used to certify that all of the new Uniform Hazardous Waste Manifests and Continuation Sheets meet the EPA's exacting standards for these forms. You can rest assured that the form you purchase at Form8700-22.com will meet both the EPA's manufacturing standards and your expectations for quality, usability and reliability.